A Chinese man was arrested after he allegedly abandoned a newborn baby girl in a dumpster—two hours after she was born. 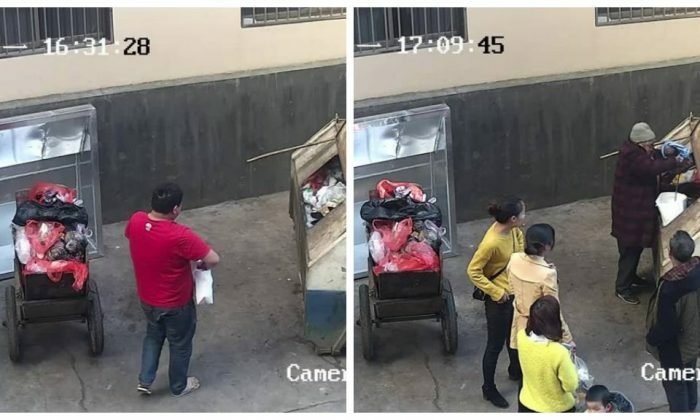 Police from Xuanwei, a city in Yunnan province, released screenshots of CCTV footage on Jan. 17, showing a man wearing a red shirt walking toward a dumpster with a white bag in hand. Another image shows an elderly Good Samaritan retrieving the baby from the public bin with other concerned onlookers surrounding her. According to a police statement, the man, with the surname Li, and his girlfriend, with the surname Lai, thought the child was not going to survive after she turned purple. They chose to get rid of her instead of taking her to the hospital. Police said Li’s girlfriend, who was eight months pregnant, suddenly went into labor on Jan. 15. As they were preparing to go to the hospital, she felt the baby coming and they delivered their newborn in the couple’s living room. Two hours later, the couple noticed that the baby had turned purple. Thinking that the baby wouldn’t survive, Li wrapped the baby in a towel and placed her in a takeaway bag before throwing her in a dumpster. After being taken out of the dumpster by the Good Samaritan, the baby girl was taken to the hospital for a checkup and was confirmed to be healthy. She was then transferred to the Xuanwei Children Welfare Office. Police said the couple have been living together for two years and are not married. Lai had not done any check-ups during her pregnancy. Many social media users have expressed outrage towards the man for abandoning the child. Infant abandonment, especially in baby girls, is an ongoing problem in China. When the one-child policy was put in place by the ruling Communist party, many parents decided either to abandon their babies or have an abortion upon discovering that their child was a girl. Li was arrested and remains in police custody while his girlfriend, Lai, was released on bail.